Description: This was the second paint scheme variation applied to LIRR's FA cab cars, adding yellow on the pilot area. Shot on the Port Jefferson branch at MP 45 (from Penn Station) between Smithtown and Kings Park. Date of photo approximate. Description: An eastbound push-pull passenger train in "pull" mode departs Long Island's picturesque Mill Neck station on the Oyster Bay branch. That's Dave's '66 Plymouth Belvedere parked by the platform. The station was closed by the railroad 3/16/98 and now houses a post office and police substation. Date of photo approximate. Description: Down from Oyster Bay. Description: Cab signal trouble? 1552 to the rescue! Exact date not known. Description: Defiinately needing new paint! Description: Classic FA noses, shortly after this became the new scheme. Description: Laying over for the weekend, 3 generations of diesels! Description: LIRR ran an all parlor fan trip on the Main Line to Greenport in May 1981. Here we see the fantrip at the yard there, with 620, next to the Greenport Scoot behind FA 602. Description: One of the prettier areas on the north shore was Locust Valley on the Oyster Bay Branch. This train has just left the station and is rolling for Mill Neck and the end of the trip at Oyster Bay. The building on the left was once Locust tower, now a substation for the Nassau County PD 6th Precinct. Description: The west end of many trains was as interesting, if not more so, than the front. Heres an aging FA 2 bringing up the rear of this Ronkonkoma train. Description: The west end of the Bay Ridge trip had Alco 602 for the cab. 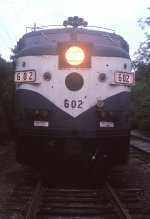 Description: The power pack on the Bay Ridge excursion was FA 2 602, seen here at the photo stop in Forest Park. The weather was dismal, as it always seemed to be when I went on a fantrip. Description: The nose of FA 602 seen at Clinton Rd on the Mitchell Field Secondary. Description: The west end of the Bay Ridge excursion train as it sits and Clinton Rd. It will shortly head back to Jamaica. Description: The Bay Ridge exccursion sits next to a revenus Port Washington train at the end of the line. Description: It doesnt get much closer than this!! An October 1985 fantrip covered the Bay Ridge branch, which had recently been acquired from Conrail. At the time, float bridges were being reconstructed at the Bay Ridge yard. The tracks would be extended to them once they were completed, but for now, its a rather abrupt end. Description: FA 602 always looked like it had been beaten up in the mid 80s. Here it is leading a Ronkonkoma train approaching the station at Mineola. Description: Horns added for open house, and was started up! 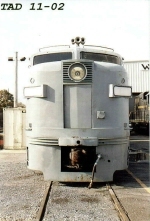 Description: That classic Alco nose & headlight grill! Description: Winchester & Western yard. Description: WPMI61 heads north out of Millville Yard with former Long Island power car 602, nee L&N, and 50 cars. Description: Moving to SMS from Bridgeton for some work and painting. Description: MI61 heading north through Vineland with the FA2 in the third engine slot.